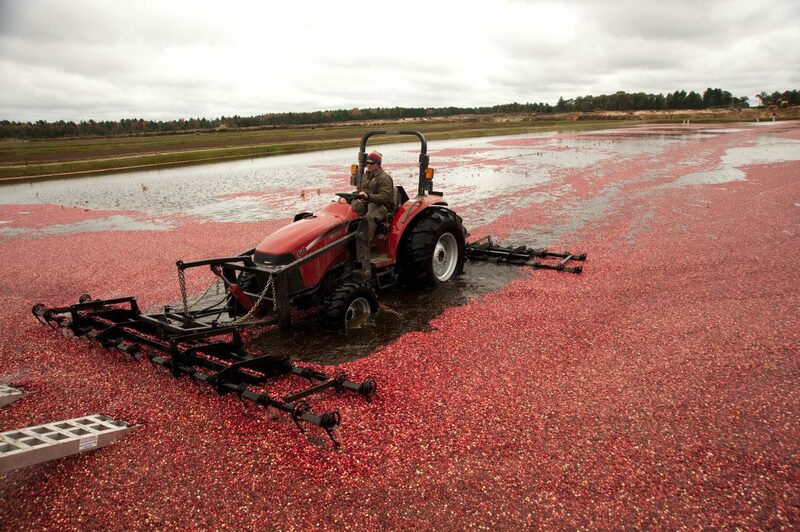 A worker on the Wetherby Cranberry Co. marsh harvests cranberries in Warrens, Wis. Economists say that if China’s threatened tariffs come into effect they will have a negative, fairly immediate, impact on the U.S. agriculture industry. In Wisconsin it could significantly impact exports of ginseng, cranberries and soybeans. In March, President Donald Trump announced a 25 percent tariff on steel imports and a 10 percent tariff on aluminium imports from all countries except Canada and Mexico. Numerous countries, including those in the European Union, also were excluded later. Trump’s actions were lauded by the U.S. steel industry but sparked a back-and forth of retaliatory actions with China — sparking intense criticism from U.S. industry leaders and politicians. U.S. Rep. Ron Kind, a Democrat from Wisconsin, wrote an op-ed in the Tomah Journal criticizing the president’s actions. “Instead of supporting growth in our farms by opening new markets and making a push for more exports, the president is creating trade policies that do more harm than good,” Kind wrote on March 26. “This short-sighted decision will raise the cost of farm equipment, eliminate jobs and be the grounds for retaliation by the trading partners we rely on…,” he said. The action did trigger retaliation, but the full effects of escalating threats between the two counties can’t be measured yet. Economists agree, however, that if China’s threatened tariffs come into effect they will have a negative, fairly immediate, impact on the U.S. agriculture industry. In Wisconsin it could significantly impact exports of ginseng, cranberries and soybeans. Steel and aluminum were not the only goods the United States threatened to slap with tariffs. On March 22, Trump instructed the U.S Trade Representative to put together a list of additional product tariffs against China and to pursue dispute settlement in the World Trade Organization regarding technology licensing practices. In response, the Chinese Embassy released a statement saying it was “strongly disappointed” that the United States was “ignoring rational voices” and disregarding their mutually beneficial relationship. The country then imposed a 15 percent tariff on 120 U.S. products — including cranberries of which Wisconsin is the nation’s leading producer — and a 25 percent tariff on eight other products including pork. The tariffs affect more about $3 billion worth of U.S. goods, according to Quartz. Both the original steel and aluminum tariffs and China’s retaliatory list are in effect. On April 3, the U.S. Trade Representative released a list of suggested tariffs on 1,300 Chinese goods, largely focused on technology, machinery and aerospace industries. The next day, China announced another set of retaliatory tariffs on 106 U.S. products worth over $50 billion annually, according to CNBC. The list included soybeans, corn, dried cranberries and meat. Both the original U.S. steel and aluminum tariffs and China’s retaliatory tariffs will negatively impact farmers, experts said. But if China’s second set of tariffs go into effect, it will have a fairly immediate impact on Midwest farmers who grow a lot of corn and soybeans. 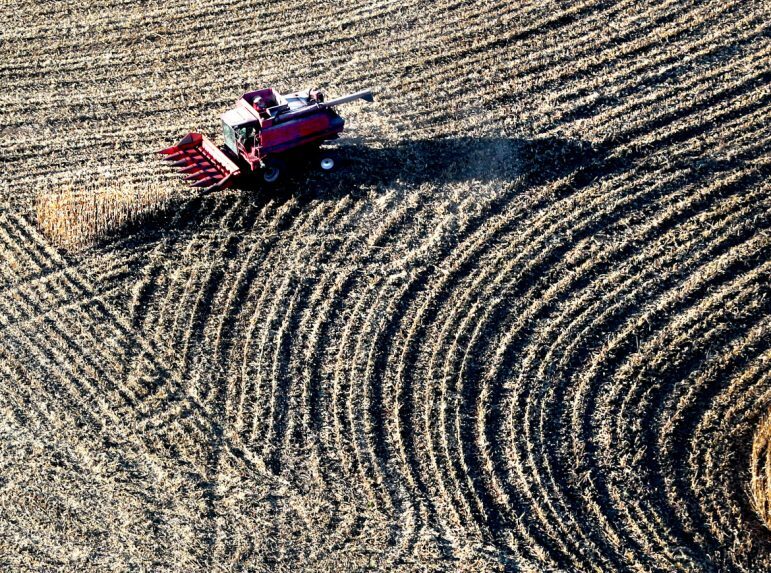 Here, a farmer combines corn near Blair, Wis.
Then Trump doubled down, threatening an additional $100 billion in the tariffs the next day. The U.S. tariffs could have gone into effect in early May. However, days before the deadline, the White House announced it would send a delegation to China to discuss the two countries’ trade relationship. China said its implementation date depends on what the United States decides to do, according to a Chinese news agency. Farms across the nation are already feeling squeezed. In the last five years, net farm income has dropped by 50 percent and many farm families have diversified, with at least one member earning a salary away from the farm, according to economists. “We’re very concerned about our bottom line all the way around,” Veronica Nigh, an economist with the American Farm Bureau Federation told The Observatory. Both the original U.S. steel and aluminum tariffs and China’s retaliatory tariffs will negatively impact farmers, experts said. But if China’s second set of tariffs go into effect, it will have a fairly immediate impact on Midwest farmers who grow a lot of corn and soybeans. The United States exports 30 percent of soybeans it grows to China every year, roughly $14 billion worth, according to the Farm Bureau. Wisconsin exported more than $7.2 million in soybeans to China in 2017, according to the Richard Hummel, a communications specialist for the Wisconsin Department of Agriculture, Trade and Consumer Protection. Additionally, the tariffs could also impact $11 million worth of cranberries, and $14 million in ginseng that the state exports to China. However, products such as soybeans or No. 2 yellow corn are generic commodities — these products are grown around the world,, said Brian Gould an agricultural economics professor at University of Wisconsin-Madison. If those tariffs take effect, China will likely stop importing U.S. soybeans, Gould said, because with the tariffs, they will cost more than soybeans from other countries. That’s a problem for farmers. The amount of soybeans and corn they have to sell this year is already set because farms typically make planting decisions at the beginning of the calendar year. Without exporting to China, farmers will need to sell those products domestically — flooding the market. That will cause market prices to drop, causing farmers to make less from this year’s crop — and any stored product, an asset, will lose value. “You’ve lost dollars even though you haven’t done anything,” Gould said. Even the threat of tariffs sent waves through the market. Nigh said soybean prices dropped 30 percent when the news broke. But she said prices recovered some when people realized they wouldn’t take effect immediately. “(That) can kind of give you an idea of what’s to come if those tariffs were to come into effect,” Nigh said. Even through the second round of tariffs haven’t been imposed yet, China’s imports of U.S. soybeans have taken a dive, according to a report by the Wall Street Journal. Chinese importers are holding off on purchasing U.S. soybeans and making contracts for future purchases, the newspaper reported. For comparison, the week of Feb.1, 2018 the United States exported about 809,000 metric tons of soybeans to China, but the week of April 26, 2018, it exported only 193,000 metric tons. The Farm Bureau has already heard from pork farmers that prices have dropped considerably since the first set of Chinese tariffs. But because export data are sent on a monthly basis, Nigh said they don’t have a good idea of the full impact. While the retaliatory tariffs will likely reduce farms’ income, the steel and aluminum tariffs will increase the costs to run a farm. Imported steel will have a 25 percent tax on the current price, and domestically produced steel will raise the price to match it, according to UW-Madison professor Ian Coxhead, a development economist who specializes in globalization, growth and development in East and Southeast Asia. The higher costs that farm equipment manufacturers incur to produce farm machinery will be passed on to the farmer who buys it, Gould said. Indirectly, prices to transport agricultural products will go up because the industry that transports them will incur increased equipment costs as well, Coxhead added. Gould explained the retaliatory tariffs on commodities could have an immediate impact, but the steel and aluminum tariffs could have a delayed impact. It all depends on the individual farm, according to Nigh. “I liken that to each of our individual checking accounts. How long could you go without a paycheck?,” she said. Prices were good for agricultural products in between 2011 and 2013, and farmers were able to save money, she said. “At some point, those reserves start to run out. We have seen a small increase in bankruptcies over the last couple of years, and the longer the low prices last, the more likely it is that there would be more,” Nigh said. Smaller farms typically have proportionately more debt obligations than larger farms, and are not able to save as much during the good years. Both those factors would make them more vulnerable to prices changes in the market, Nigh explained. Eventually, those impacts will cascade through the multi-billion dollar agribusiness industry, Coxhead said. It will impact companies that transport agricultural goods, companies that store product in grain elevators and businesses that sell seeds and other supplies to farms. “If farmers cut back production and stop buying inputs, then the whole ag economy that revolves around farmers buying stuff and selling stuff starts to get productivity levels brought down as well,” Coxhead said. Coxhead said he believes the real fear is the possible macroeconomic impact a trading dispute could have. Gould said the president’s move to restrict free trade is “unprecedented” by going against 25 years of policies promoting free trade that have let countries specialize and expand their markets, but which some critics claim has come at the cost of American jobs. The last time the world saw a global trade meltdown was in the late 1920s, a precursor to the Great Depression. “That was set off by exactly the same kinds of rhetorical pressures and mercantilist thinking that, ‘Nobody wins from trade, you only win if the other guy is losing,’ ” Coxhead said. Nigh said these tariffs could have a similar impact to the grain embargo of 1980, when the United States banned grain exports to the Soviet Union. The government heavily subsidized farms to compensate for the loss this caused, but the U.S. Department of Agriculture forecasted that net farm income would drop 40 percent, according to the Foreign Affairs magazine. President Ronald Reagan made good on his campaign promise and ended the embargo in 1981. Nigh added that if people had taken Trump’s statements at face-value, they shouldn’t be surprised by his actions because he has consistently vowed to rewrite trade deals that he claims put the United States at a disadvantage. But Gould and Coxhead said they can’t predict what Trump will do going forward, or how this dispute will end. Maybe, Coxhead added, the administration’s secret goal is to get China to offer safeguards for intellectual property, which would be a big win. In order to do business in China, U.S. companies have reportedly been forced to turn over trade secrets and technology to Chinese companies, according to the U.S. Trade Representative. Gould said that in the current U.S.-China dispute, politics, and not just economics, have come into play. He believes some of the president’s rhetoric and policies surrounding trade, are to satisfy his political base. This trade dispute with China is only part the agriculture community’s worry, Nigh said. She added the Farm Bureau was pretty excited about opportunities under the Trans-Pacific Partnership, but Trump withdrew from that trade deal only ten days into his presidency. He has also threatened to pull out of the North American Free Trade Agreement with Canada and Mexico. It’s a good thing for other countries if U.S. agricultural products become less competitive, because U.S. partners and competitors can join together for their benefit, and our expense. Nigh noted the E.U. and Mexico just announced their revised free trade agreement, and it will include agricultural products, which it hadn’t before.